The most recent issue of the Soilmec Journal is now available. 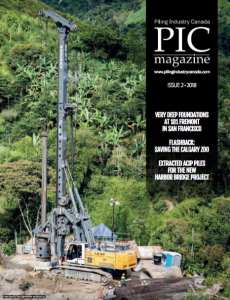 Published twice a year by Soilmec S.p.A., the journal reports on international projects and important new Soilmec products and technology. This issue’s cover story describes developments in Copenhagen’s Cityringen Metro Project, one of Europe’s largest construction jobs, which will streamline traffic and downtown access in Denmark’s capital. A 15.5 km circular route around the city center will be accessed through 17 new stations. Challenges include tough drilling through hard soil and rock, an accelerated project schedule, and strict environmental controls. Ten Soilmec drilling rigs were deployed around the city—two SR-90s and eight SR-100s—to build diaphragm walls for the new stations. The walls are being built using cased auger pile/cased secant pile (CAP/CSP) technology, which is ideal for urban construction because it minimizes soil disturbance and subsidence in adjacent properties or structures. The heavy-duty SR-100 is the star performer. The 150-ton class rig is powered by a Deutz TCD2015V8 Diesel engine that delivers 480 kW rated power, equipped with the Soilmec double independent rotary system that gives 284 kNm torque to the auger and up to 384 kNm torque to the casing. The SR-100 crowd system can transmit a force of 400 kN and a max extraction force of 1140 kN, allowing the drill to reach a depth of 28 m (21 m cased). On December 12, 2012, a tunnel collapsed on a railway line under construction near Lanzhou, the capital city of China’s Gansu province. Within hours, a Soilmec team was on site with an SM-14 to open a rescue passage through which air, water, and food was made available to the five people trapped inside. All five workers survived. The “face” of a tunnel (where the tunnel daylights) often requires stabilization. For new tunnels along Italy’s A-14 highway, a Soilmec ST-120 was used in a new, patented jet-grouting technology to simultaneously inject grout columns and install a steel casing element for permanent reinforcement. The ST-120 features two different masts independently controlled and powered by two electric motors and supported by two telescoping cylinders. To construct foundations for a major new urban development in Singapore, consisting of four residential blocks of 18-story buildings, two blocks of 16-story buildings, a multi-story car park, and community facilities, Scanpile Construction Pte Ltd used a Soilmec SR-90 to drill through stiff sandy silt and socket the foundations into granite bedrock. The piles ranged in depth up to 36 m (120 feet) and in diameter up to 900 mm (36 inches). Soilmec S.p.A, a company within the Trevi Group, designs, manufactures, and services machinery and equipment for ground construction and foundation engineering. Soilmec develops safe, innovative, cutting-edge technologies and provides the construction industry with a full spectrum of equipment solutions. Soilmec equipment is used every day on jobsites all around the world for roads and bridges, tunnels, railways, buildings, and projects of all types. Champion Equipment Sales, LLC, and American Equipment & Fabricating Corporation are the agents for Soilmec equipment and technology in Canada and the U.S.